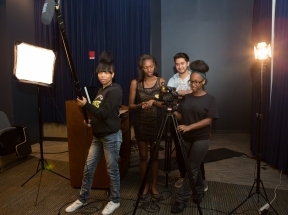 First the girls learn foundational skills alongside DePaul student mentors and are then partnered with professional filmmakers who help them shape their stories. This year’s topics include teen pregnancy, neighborhood violence, single vs dual parent homes and bullying. As part of CHA’s Year of the Youth campaign, this collaboration is part a year-long youth engagement effort that includes unique professional and youth-related programs focused on mentoring young people and putting them on a strong career path to college and jobs.